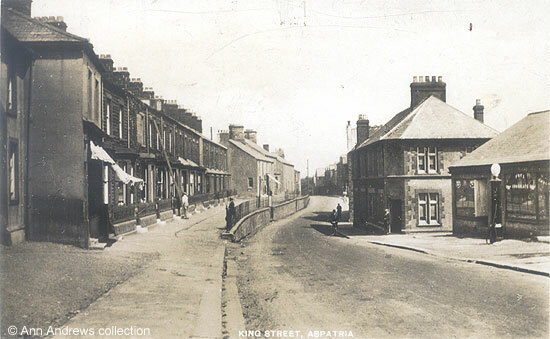 "ASPATRIA, with Brayton, form an extensive parish, in the Northern division of the county, ward and petty sessional division of Atterdale-below-Derwent, Wigton union and county court district, rural deanery of Maryport. and archdeaconry and diocese of Carlisle. Aspatria is a village, bounded on the south by the river Ellen, and on the west by the sea, and is situated on the main road, between Maryport and Carlisle, with a station on the Maryport and Carlisle railway, 8 miles south-west from Wigton, 8 east-by-north from Maryport, 9 north from Cockermouth and 19 south-west from Carlisle. The village is lighted with gas from works, the property of a company, and is said to derive its name either from Gospatrick, a former lord of Allerdale, or from Aspatrick (an equivalent of St. Patrick), a predecessor of St. Kentigern ; but the present form of the name is stated to have come into use only within the last century". King Street is on the A596 trunk road between Maryport on the coast and Wigton. I assume this card must date from around 1930, or shortly before, which is when a relative moved to Aspatria. All the people in the photograph are adult males. Otherwise there are only three "clues" to help to date the image. There are no street lights. The shop on the extreme right advertised Fry's chocolates on the shop window but, unfortunately, the name of the proprietor is indistinct. There's a petrol pump (or pump for paraffin, though probably petrol) outside the shop. The man standing at the bottom of the ladder seems to have a bucket beside him, but there is no sign of anyone working at the top of the ladder so it is unclear whether they are painting or repairing the building, or simply cleaning windows. So if anyone can actually date the picture I would be very grateful. I would also like to hear from any member of the Stoddart family for some help, especially if in the past one of them had a family member linked to Salford Rugby Club.